The Casa Marina Hotel in Jacksonville Beach, Florida is one of those places that definitely brings you back in time to days of elegance and distinction, the era of old Florida charm, the beginning of our history as a State. Today it is a most coveted wedding destination place. This 25 room historic landmark sits on the seacoast, and is a well kept secret... a perfect place to hold your classic and very romantic wedding ceremony. Your social event can be held in the garden, the beach, or inside the lovely venue, in this location, just about any spot you choose will have a special meaning. Your guests can enjoy a fun cocktail reception featuring your very own Signature Martini, or be seated and delighted with a full course dinner prepared by their creative Chef. Casa Marina is famous for their Sunday brunches, one of which I had the pleasure of sampling, and ooh-la-la, what a treat to the palate that was! You may select from an ample variety of dishes for your luncheon or dinner style reception, whatever your choice is, you can savor their gourmet cuisine in their formal dining room or their lovely outdoor garden setting. Keep in mind, no matter what kind of bridal celebration you desire; the Casa Marina offers natural elegance, coziness, plus picture perfect spots that will help create memorable memories. I had the opportunity to enjoy this location first hand a while back, and this was enough to convince me that I wanted to share this precious gem with the bridal readers on my web site. Casa Marina sits oceanfront, nestled against the growth the city has seen in the past few decades; yet this historic venue retains an aura of days gone by, and seems almost untouched by modern times. The entrance to the lobby has rich, beautiful, wood and frosted glass double doors, a perfect grand opening for what awaits for you inside. I prefer cozy greetings, and that is what I encountered as I spoke to their friendly reception desk, and received my room key. Just behind me stood a magnificent and inviting grand bar, one in which I was told Al Capone sat at once. I am a sucker for history, and I felt like I was re-living the beginning of the early days of FLorida, felt a sense of being taken back in time by the black and white old pictures that adorn the halls. These images spoke to me, sharing the past and our heritage. There is beauty all around, especially in their rooms; each suite has a different and creative theme decor. The accomodations have all been re-done with a unique style, but caution was taken to retain that old Florida feel. Every corner of the hotel has been given a new light, with priority to making sure that the walls still whisper the interesting tales and convey a multitude of amazing stories to their guests. Although I was there for only a short time, I felt so at ease during the evening hours at “The Penthouse”, their chic upstairs lounge, is the summit and culminating point of the location. It is decorated in a very South Beach art-deco style, an eclectic mix with that contrasts with the well appointed elegance of the rest of the building. It is the crowning glory, which tops off this structure with a modern touch of today. This ample lounge at the Casa Marina has inside and outdoor seating with a breathtaking view to the beach and the magnificent sky. The Casa Marina lounge is perfect for a bridal rehearsal cocktail, or a friendly get-together. 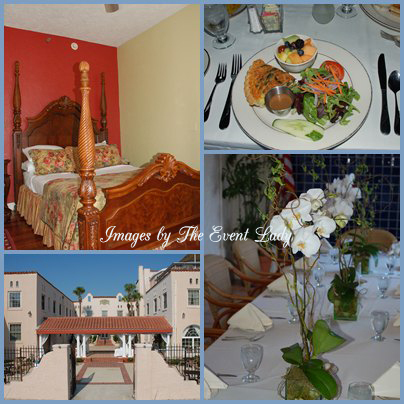 I found Casa Marina a superb place to enjoy a much needed weekend get-away vacation or maybe a wedding anniversary gift idea. After a tour of the Jacksonville Beach area; I realized that The Casa Marina Hotel is a regional treasure to maintain for other generations to enjoy. This property is irreplaceable for those of us who know the value of yesterday’s history, and the impact it made in our beloved Florida of today. It is a revival of the spirit and tugs away at the core of our Floridian hearts. Simply summarized, it is a unique and beautiful spot for lovers; a destination for a romantic wedding, a lovely honeymoon retreat. Casa Marina is a priceless landmark, one that anyone who appreciates timeless beauty, will forever enjoy! www.CasaMarinaHotel.com in Florida is the only HHA (Historic Hotels of America) property in NE Florida. Casa Marina Hotel, a historic landmark of Florida in Jacksonville Beach. Click here if you cannot see Slide Show above!